Tiger Woods joined President Obama for a round of golf in Florida on Sunday. It was the first time the two have played together. President Barack Obama had some noteworthy company when he hit the links in Florida on Sunday: Tiger Woods. The White House confirmed that Woods was among the president's foursome for a round of golf at the Floridian Yacht and Golf Club in Palm City, Fla. Rounding out the group were United States Trade Representative Ron Kirk and resort owner Jim Crane. The president is in the midst of a three-day retreat in the Sunshine State while First Lady Michelle Obama and the couple's children ski in Colorado. An avid golfer, Obama has played more than 100 rounds since entering the Oval Office, a statistic his political rivals have tried to use against him. It was not until after the round that the White House confirmed news that the president shared the course with one of the sport's biggest and most controversial names. Woods' career took a nosedive after it was revealed he had cheated on his wife with multiple women, but he has since been rehabilitating his image and is currently ranked the No. 2 golfer in the world. Golf Digest's Tim Rosaforte broke the news of the powerful pairing Sunday morning, tweeting that the president had arrived at the course and was awaiting Woods. It was their first round together, but Obama did host the golfer at the White House in April 2009, seven months before Woods' marital transgressions became public. Though there has been no official word on how either of the men played, Rosaforte tweeted that Woods sunk a shot from the bunker for birdie on the first hole. 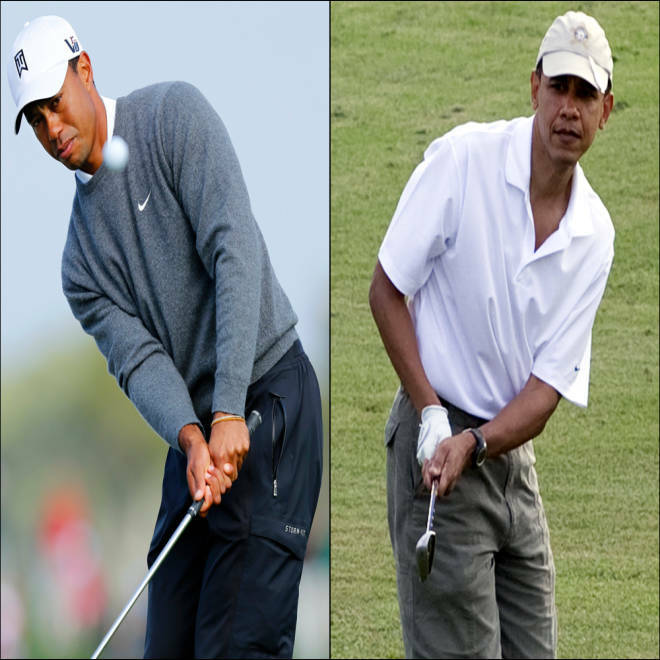 Rosaforte also reported on the Golf Channel that Woods was in no way holding back for the commander-in-chief. Instead, the once top golfer in the world was putting on a show, driving the green of a 378-yard par 4. Obama's golf game should be as good as it has ever been. On Saturday he spent eight hours with Woods' former swing coach Butch Harmon, playing 27 holes and hitting balls in the instructor's golf studio, Golf Digest reported. Sunday's outing was closed to media, but Harmon recounted to Golf Digest the interaction he witnessed between Woods and Obama. "The president said to Tiger, 'The last tournament you played was fun to watch. It's good to see you play well again.' You could tell he meant it. It just wasn't a throw it out compliment," he told the magazine. Harmon also said that when it comes to tallying up his scorecard, Obama plays by the rules. "He counts every shot. He doesn't like gimmes. He putts everything out. He counts all his penalty shots. He thinks about all his shots before he hits them. Some people might say to the President of the United States, 'Oh, just move it.' But that's not him," said Harmon. "He loves the game and loves the game the way it's supposed to be played."